It’s approaching Christmas. The trendy word for decorating this year is “festooning”. Mel Fortune and men’s eyes. (I should probably have resisted it, but I am weak.) First, the physique magazines: see my 7/17/16 posting “A remarkable website”, with a section on Bob Mizer and his physique photography in the 1940s through the 1960s. The photos were often pretentiously themed, but many were consciously antic, as in #1.
noun kitsch: art, objects, or design considered to be in poor taste because of excessive garishness or sentimentality, but sometimes appreciated in an ironic or knowing way: the lava lamp is an example of sixties kitsch. DECORATIONS GALORE! My decor is not limited to the interior or the front of my house! I dress the swimming pool in the season’s best! My guests gasp with delight at the sight of a Cotton Candy Kitschmas with sleigh and reindeer floating and festooned in pink toule and pink cotton batting! Swimmingly Sweet! COCKTAIL TIME! The late-night gang will be stopping by at the cocktail hour! I change into a more festive skirt and shoes. I simply roll the smaller television set back in and festoon the larger televison cabinet with a tablecloth and sparkley garland! I ready the eggnog and jello molds, then hide the daytime decorations and lampshades! The night-time pals can cause quite a ruckus! But I do provide a lute to accompany the evening’s caroling! noun festoon: [a] a chain or garland of flowers, leaves, or ribbons, hung in a curve as a decoration. 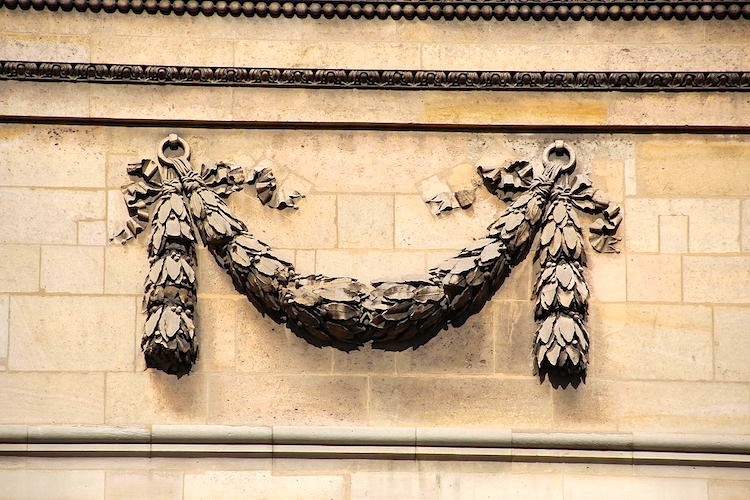 [b] a carved or molded ornament representing a festoon. verb festoon: [with object] (often be festooned with) adorn (a place) with ribbons, garlands, or other decorations: the room was festooned with balloons and streamers. ORIGIN mid 17th century: from French feston, from Italian festone ‘festal ornament’, from festum, (plural) festa ‘feast’. Beyond these bare lexicographic facts: festoon is the object of word attraction — specifically, word amusement — for many people (of whom I am one). We find it giggly. So, obviously, does KB. a letter of mine published in Verbatim some time ago [posted on this blog here], on several language games, the first of which took off from an Olive Cahoon who married a man named Cahoon and so became Olive Cahoon Cahoon. That set some of us off to playing with the family name Cahoon and its far-flung members: Monsoon Cahoon, Rangoon Cahoon, Pontoon Cahoon, and so on. [on the coat of arms of Pennsylvania:] The state motto, “Virtue, Liberty and Independence”, appears festooned below [an array of symbolic images]. I dressed for you. Haefeli’s gay guys are dealing, not terribly well, with one of the complexities of romantic / sexual coupling: the trappings you take on to make yourself attractive to a potential partner may well become irrelevant when you reach the getting naked together stage — or even impediments to intimacy. The clothes (on which you might have spent considerable effort to choose them and to wear them just so) only get stripped off. Fragrances that are attractants at a distance might be unpleasantly powerful at ground zero. For men, taking off basket-enhancing clothes might reveal unexceptional equipment; and facial scruff that advertises your masculinity and toughness (note the scruff on both of Haefeli’s guys) might well just induce beard burn in your partner. For women, carefully applied makeup, mascara, eye shadow, lipstick, and so on can become messy annoyances in a passionate clinch. For Haefeli’s guys, fretting obsessively over the way they present themselves is especially comical, because the two of them are pretty much cut from the same cloth, with only tiny differences distinguishing them. Of course, when differences are tiny, each one becomes that much more significant. 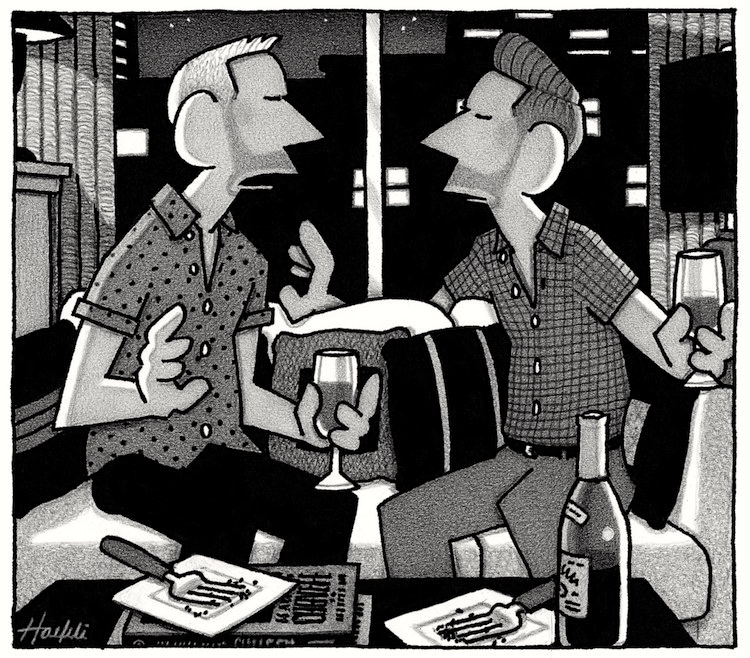 This entry was posted on December 14, 2018 at 8:57 pm and is filed under Gender and sexuality, Holidays, Homosexuality, Linguistics in the comics, Male art, Mammoths, Pop culture, Word attraction. You can follow any responses to this entry through the RSS 2.0 feed. You can leave a response, or trackback from your own site.